Many bacteria, such as E. coli, propel themselves in water using rotating helical tails called flagella. They sense chemicals in their surroundings and alter their swimming behavior in order to move toward favorable environments (and away from unfavorable ones). This phenomenon is referred to as chemotaxis. Bacterial chemotaxis serves as a model for the way all living cells capture and process signals from their environment, and modulate their behavior based on those signals. 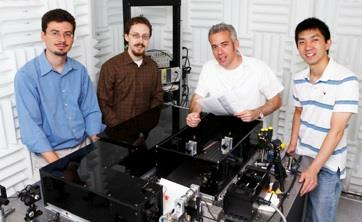 The laboratories of Professors Yann Chemla and Ido Golding in the Department of Physics at the University of Illinois, Urbana-Champaign have recently developed a new method to study this process (Nature Methods 6 (11):831-835, 2009). Using optical “tweezers”, or focused laser light, they immobilized individual E. coli cells in water without impeding their swimming motion. In essence, this generated a “bacterial treadmill” in which a cell swims but remains in place. This technique allowed the team to follow bacterial swimming over long durations and with a resolution hitherto unachievable. 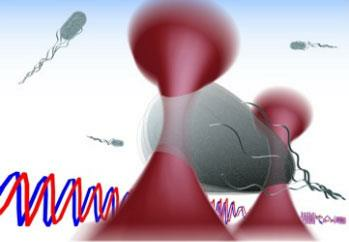 The figure above is an artist's rendering of a bacterium held in the light of the optical tweezers (depicted by the red cones).